Quezon City – If one looks back at the colorful history of baseball in the Philippines, it is hard to fathom how the sport has struggled in recent years. Once described by the Washington Post as being more talented than the average American baseball player, Filipino baseball athletes paved the way for Asians to engage in America’s national pastime, as baseball is known to be. Perhaps the most memorable event for thousands of Filipino fans was when Major League legends Babe Ruth and Lou Gehrig hit the first two home runs out of the newly built Rizal Memorial Stadium in 1934. The Philippines was liberated from Spain by the United States, who further colonized the country for almost five decades. They brought baseball along with them, which became a national obsession for years. Introduced in 1898 by the US military, it quickly gained popularity, especially with the masses, as the elite were too concerned about their complexions getting too dark or their hands getting rough. Filipino workers in the US Army base mastered the sport and soon it was being played in public schools throughout the country. Paco Baseball Park in Manila was the first ever baseball field built in 1902 and was intended for the private use of the Manila Baseball League. Most leagues were first established in the capital city, with four schools launching their baseball teams in 1903, namely, Liceo de Manila, Philippine Normal School, Cavite High School, and the Philippine School of Arts and Trades. Different clubs were founded thereafter, including the Southern Luzon Athletic Association founded in 1904, which holds the distinction of being the oldest athletic organization in the country. Alejandro Albert, known as the father of Philippine baseball, organized the first Filipino baseball team tour to the United States in 1913.This tour aimed to let the world know that Filipinos are good baseball players, as well as to further interest in the game. The Manila baseball club, also known as “brownies,” traveled for three months and made stops in Japan and Honolulu before garnering a 16–38 record against different teams in the United States. Starstruck fans were thrilled when an all-star club journeyed to the Philippines in 1934 and played for a week in Rizal Memorial Stadium. The all-star club included Midwest Regional League (MRL) Hall-of-Famers Babe Ruth and Lou Gehrig, who each hit a home run, along with other players such as Charlie Gehringer, John McGraw, and Earl Averil. Baseball fever was at its peak when the Philippines won the first Asian Baseball Championship in 1954, defeating Japan in the final game 8–1. Bobby Balcena was the first player of Filipino ancestry who appeared in major league games. He was born in San Pedro, California, and played for the Cincinnati Reds in 1956 as an outfielder. The lack of funding, insufficient training facilities, and the absence of promotion, especially on national television, contributed to the waning of the popularity of baseball in the country. The sport remained dormant for years. After four decades, the desire to make baseball popular once again is apparent with the increasing number of clubs from different regions, as well as the country’s participation in international tournaments, such as the Southeast Asian Games and the World Baseball Classic. Although attempts to come out on top were rather unsuccessful, the Philippine team nevertheless fared better than in the previous five years. 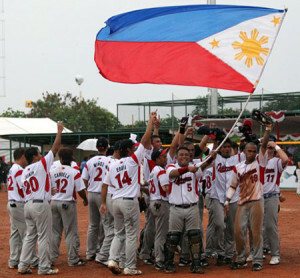 A start-up baseball circuit called Baseball Philippines was incorporated in 2007 to aid the advancement of the sport in the country. The Japan-based semi-professional baseball league Shinano Grandserows Baseball Club recently recruited 22 year-old Alfredo Olivares Jr. from Nueva Ecija, who succeeded after a series of rigorous tests. He is the first ever Filipino to be inducted in the team, known as the breeding ground of great Japanese players who play for the Los Angeles Dodgers. Geno Espineli, former San Francisco Giants pitcher and the first full-blooded Filipino Major League Baseball player, recommended the construction of additional fields with adequate lightning to continue to build up the sport and the recruitment of athletes who are determined to succeed. In addition, he promised to revive and promote Philippine baseball to inspire younger generations to play the sport. Baseball has brought pride to the country and its people since it was first introduced by the Americans. The Philippine national baseball team is currently ranked 23rd in the world and remains competitive even if the sport has faded in recent years. Getting support and funding will not be easy for baseball, as major sports such as basketball and soccer are currently more popular among Filipinos. However, baseball fans remain optimistic that baseball's luster will someday be restored.